How would you confirm poor ventilation? Facial asymmetry Use a two-person technique?? Ensure full muscle relaxation has occurred before attempting intubation. Continuous SpO2 monitoring is essential. Cease intubation attempts and reoxygenate the patient’s lungs using bag-mask ventilation before the SpO2 reaches the steep part of the oxyhaemoglobin dissociation curve: this point is 92%. A maximum of three attempts at intubation is recommended. An intubating bougie will frequently be used to assist intubation with the reduced view. 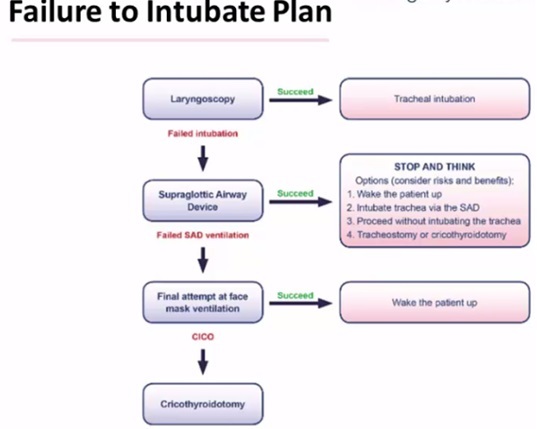 What makes EMERGENCY INTUBATION DIFFICULT?